UPDATE 9/25/08 Now at 148 lbs and seem to have gotten content here. Time for me to lose the rest that my doc wants me to lose. I'm holding my weight well distributed but doc says I have 20 more lbs to lose, but only on the condition that I keep it off. No Yo-Yo-ing allowed. There are many variations to this 0 point soup. Basic idea is to create a simple broth, add veggies and spices to your hearts content. Good for all phases of South Beach and weight Watchers. Usually I only eat two meals per day ...because I'm a poodle and I don't need as much food as the German shepherd s .. my way of saying that little short women cannot eat as much as a man. Men also have more muscle mass and can eat more than a small woman....if I eat breakfast it is usually 5 slices of banna in a half cup. Of yogurt with cinnamon sprinkled in. My second choice would be a small toaster waffle with natural peanut butter spread in it. 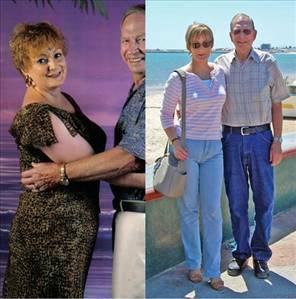 My husband went on the South Beach Diet with me and he has been diabetic a long time. His entire family of seven brothers and sister's are all diabetic, some on insulin, some on pills. Hubby was on pills (notice I said WAS). The south beach diet was written by a heart doctor but it also follows the glycemic index for low glycemic foods. Hubby had his meds reduced and in one year on the diet with me (he cheated more than me) he is no "NON-diabetic". he takes no meds at all and although his doctor continues to monitor him because of his history, he is not considered mecially a "non-diabetic". I am going to include some links for helpful sites that can get you started on south beach diet. it's easy to do and only the first two weeks are severly restricted to get you over the cravings and into fat burning mode. Once you are past the first two weeks the diet is easier to follow and opens you up to much more food choices. I heard a service about lent that changed the way I think of it. Instead of "giving up" something, think of it as "making an improvement" in your life.. whether it is to exercise to get a healthier body, or don't think of it as giving up tv, think of it as getting more involved and playing games with the family instead. Use lent as a time to improve yourself. Since I am limited on exercise at this time due to a back problem, my choice for lent is to journal something positive about myself each day and to "give thanks" for it and for the things in my life that are positive each day.